Death doesn’t always have to be so grim. Indeed, many cultures around the world have beautiful perspectives and traditions related to the theme. Indigenous Greenlanders believe that the stunning Northern Lights are the spirits of dead children dancing. Similarly, during the Odon Festival in August, Japanese Buddhists believe that their loved ones can visit the living for a day. Then later, at night, the spirits are guided back to the realm of the dead by thousands of beautiful floating paper lanterns on rivers and bays. Mexico has one of the most carnival-esque and beautiful festivals dedicated to the dead – El Día de los Muertos, or the Day of the Dead. Rather than celebrating death, this two-day festivity is a celebration of the lives of those who have passed away. Characterized by its bright yellow marigold flowers, magenta and orange flags and tablecloths, its colorfully decorated sugar skulls, and its beautiful candlelight, it is hard to find a more colorful festival around the world. Each year, The Day of the Dead takes place from October 31st and November 2nd. Where will you celebrate the festivities? In homes, offices, and city squares, you’ll find beautiful and colorful altars featuring flowers, food offerings, incense, religious icons, photos, mezcal, toys, and cheerful sugar skulls. Often, the altars feature the deceased’s favorite foods, drinks, and hobbies. The festival combines indigenous Aztec rituals with Catholicism, affirming Mexico’s rich cultural fusion and complex history. At midnight on October 31st, it is believed that the gates of heaven open to allow the spirits of deceased children, called angelitos or little angels, to visit and reunite with their loved ones for a day. November 2nd is the day when the spirits of adults come to visit to enjoy the festivities and offerings. Families decorate the gravestones and come together to tell fun stories of the dead, and to partake in the favorite pastimes of those who have passed away. Some families even take televisions to see the soccer match with their loved ones. Unlike Halloween, there is nothing morbid or scary about this holiday despite the ominous name and smattering of skulls. For one of the most authentic Day of the Dead celebrations in the country, go to Patzcuaro. You will find a charming town with colorful markets, surrounded by lush mountains of pine forests. You'll be able to appreciate the adobe houses built around quiet streets while listening to Michoacan folk music. On November 1st, you'll witness one of Mexico's most fascinating cultural traditions when the lake is lit up with the light from thousands of candles that locals set up to remember their dead. Marigolds, music, & an infectious celebration of life takes over the entire region. It's a show you cannot miss. At night, visit the graveyards in the small island of Janitzio in the middle of Lake Patzcuaro and the other surrounding towns like Tzintzuntzan and Arocutin, where the Purepecha locals still celebrate their deeply rooted indigenous traditions, to experience an unforgettable and truly authentic Mexican experience. Explore one of Mexico's most captivating and culturally diverse regions. Let yourself be surprised by the unique cuisine, quaint villages, beautiful music, colonial architecture, artisanal craftsmanship, and elaborate celebrations. Apart from Oaxaca's impressive cultural heritage, you can also explore the area's beautiful mountainous natural settings. 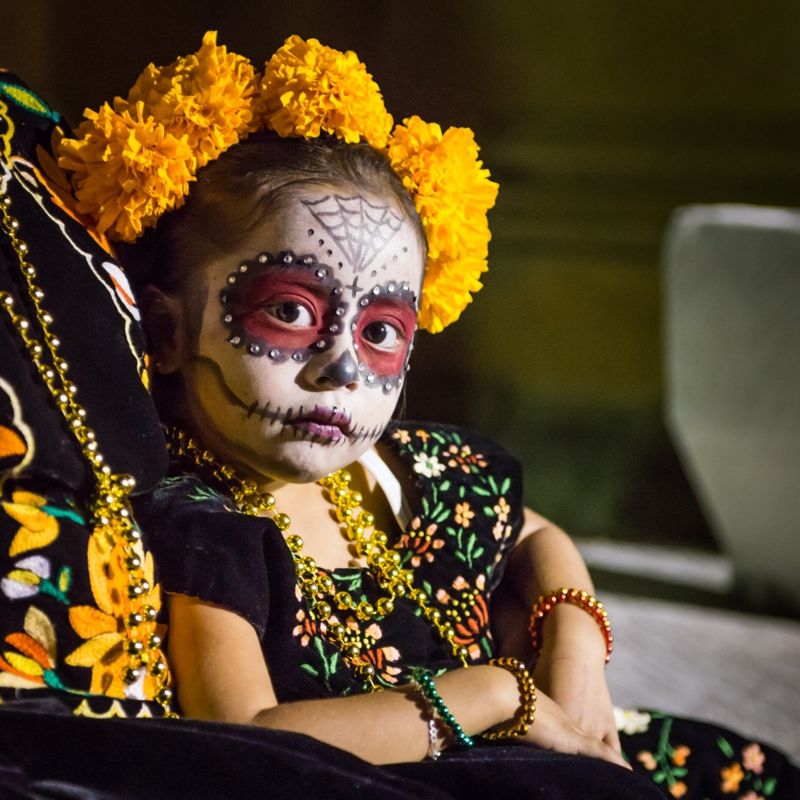 Immerse yourself in the beautiful and elaborate Day of the Dead celebrations, and experience a once-in-a-lifetime experience in the heart of Mexico's cultural legacy. Not only can you get the quintessential Day of the Dead festivities here, but Oaxaca boasts an otherworldly nightlife during the three day celebration. At the break of dawn, the streets are shut down and turned into a huge party. Celebrations of the Day of the Dead in the Yucatan peninsula are decidedly different from the rest of the country, given the large Mayan influence in the region. Here the holiday even has a different name – Hanal Pixan, a Mayan saying that means “food of the souls”. Festivities include a parade around the beautiful city of Mérida, ending in the local graveyard. The holiday revolves even more around food, and traditional Pre-hispanic Mayan foods are a centerpiece of the celebrations. Top off your cultural and foodie travels with an enchanting stay at a nearby bohemian tropical beach town. Not only does this celebration represent indigenous cultures, but it has carried itself into 2018 representing Mexico’s culture as a whole. Celebrate this day like a local by visiting any of these destinations!